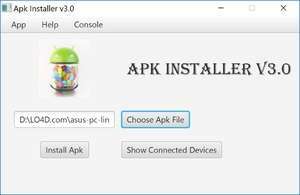 Android Package Installer is a simple lightweight GUI tool to install Android APKs from your Windows, Mac or Linux Computers directly to your Android phone or Tablet. All you have to do is to copy the apk file in working folder and type in the filename as it is followed by APK extension. This software is totally written in Java uses swing package and requires a user to Install a latest version of JDK and minimum jdk version required is JDK 7. For security reasons, you should also check out the Android Package Installer download at LO4D.com which includes virus and malware tests. Additional screenshots of this application download may be available, too.